Marc: Fix, saving board to an image in clippboard/file. AltK shows the new keys to be used. Andreas W: Fix, engine label when training Find best move. Andreas W: Fix, find best move, changed size of buttons that shows the moves. 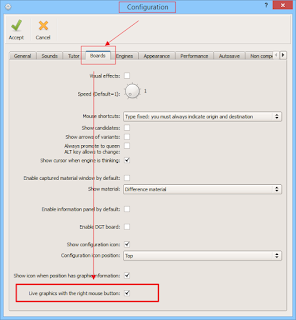 Andreas W: Fix, find best move, bad window size when resizing board. Stochastic13: Playing against any engine, with tutor, when move is a draw and there is a lot of moves better. Paul T: Fix, STS test, frozen when a engine thinks a lot of seconds, also added Run with board option. Andreas W: Fix, find best move, added info about castle and enpassant. Becoming a knight tamer, some of the options don't work. when in case O-O and O-O-O both are possible, O-O and a . means short castle. Issue #1: Training positions and Tactics, the PGN initial comment (i.e. the comment before the first move) is never shown. Issue #2: Training positions and Tactics, , the PGN last comment (i.e. the comment after the last move) is never shown. Issue #3 - Error message showed in case the engine is not found. This is a long-demanded option, the list of people who have requested it from me is too large to include here. 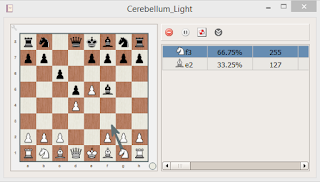 The working mode is similar to that of Lichess, if it is a square selected a circle is shown, if they are several squares an arrow is shown, by default. 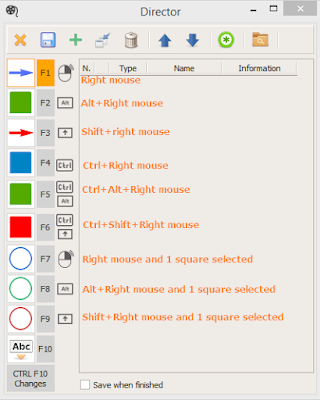 It can be customized from the Director option, each element of the band is associated to a key (None, Alt, Shift, Ctrl) pressed at same time right mouse. The deletion of elements is done by creating an equal element. The keys Ctrl-F1 to delete the last created element and Ctrl-F2 to delete all of them also work. 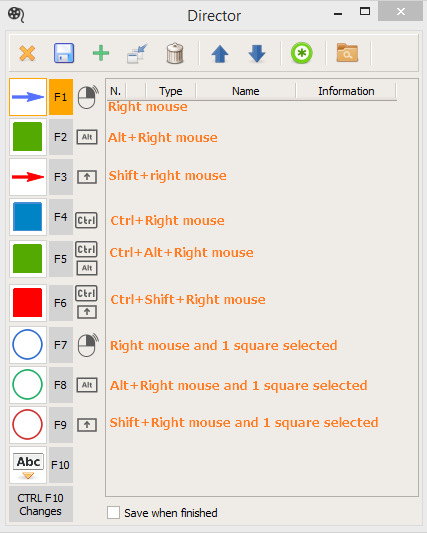 When Director mode (activated by pressing F1,...F10), Shift+Alt+Right Mouse allows user to choose a piece to add. 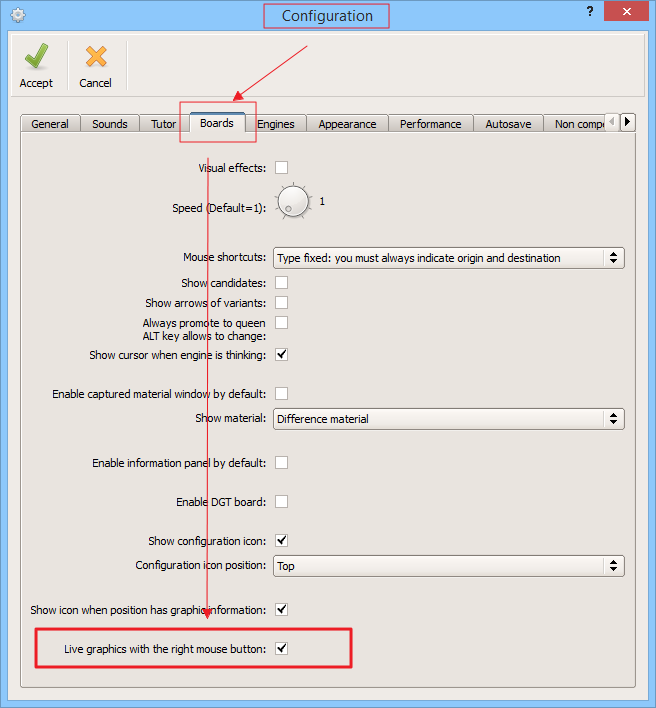 As a facility, when working in Opening Lines, with the right button you can create graphic elements that are associated with the position directly. Also when playing, from Utilities menu can be disabled/enabled. 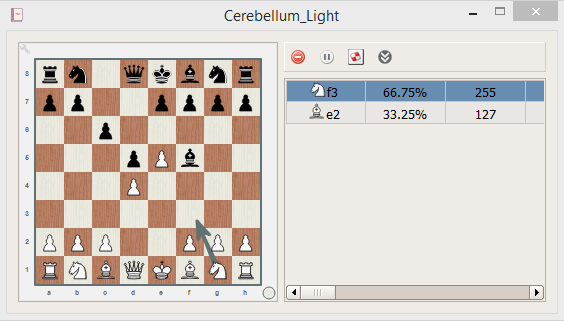 When playing against an engine from Playing against any engine option, all moves from rival are cached, then if Reinit, allways plays same moves to same positions. Tournaments between engines, memory leaks (thanks to Paul T.). Everest training does not work when the use of the tutor engine in the background is deactivated, (thanks to Duntoria). Bug: opening lines, to play against engines, it only allows to play against the last one. Bug: tournaments, when creating a new group of games does not show any game. Bug: training tactics by repetition, when manual configuration (thanks to Bernd H). Bug: Opening lines, blocking when analyzing with the engine (thanks to Eren K). The objective is to write fluently the moves in pgn, which can be useful when you start playing long live games. You choose a new game and the program selects one automatically. Then the color is selected, in order to show the board. Then a move is shown on the board and it is asked at the top to write the same in pgn format, pressing "intro key" continues with the next. There is no distinction between upper and lower case. 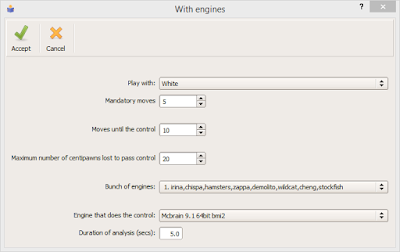 added the possibility to play against external engines. can be configured automatic analysis when failure. Opening lines, training against a bunch of engines, now number is selected by user. 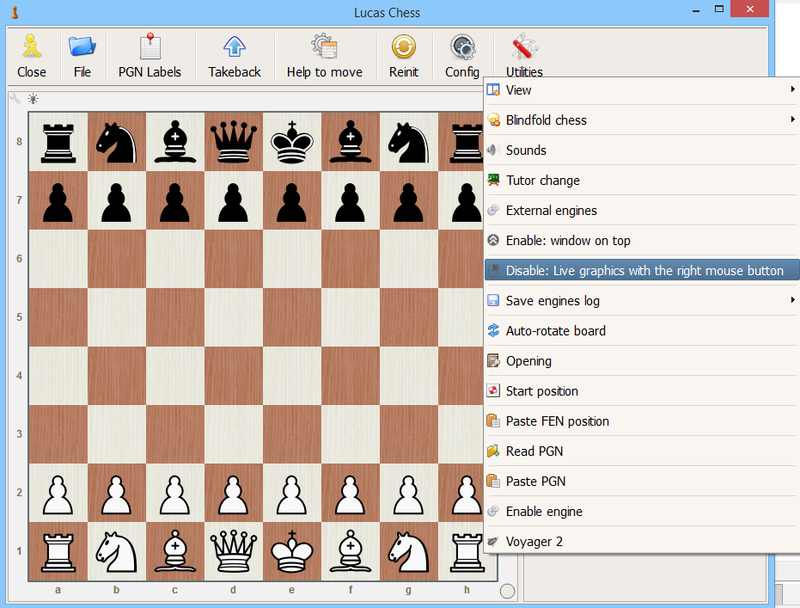 Mandatory moves: in the first part, the user and the engine must each make moves defined in the opening lines created. Moves until the control: for the second part, the motor moves without restrictions and the user must select one of the lines or another movement if not provided for in one of the lines. 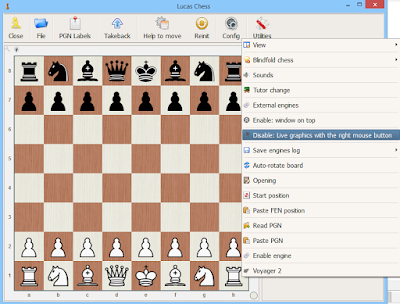 At the end, the controlling engine calculates the score of the first move out of the lines and the score of the last move, and this difference must be less than that set in "Maximum number of centipawns...", to move to the next engine. 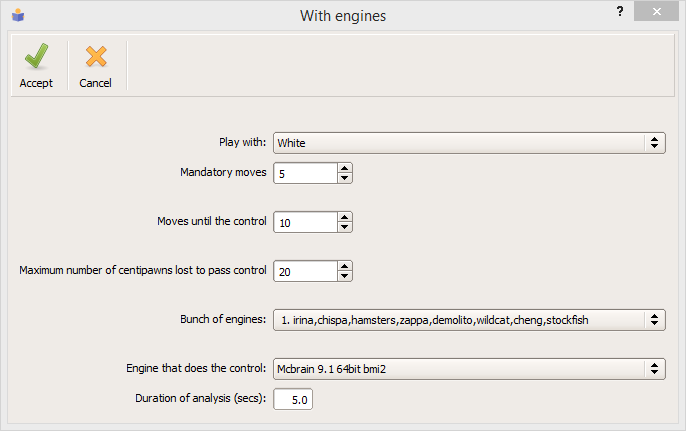 Bunch of engines: user select a block of 8 engines to play against in each level. New type of kibitzer, now is a polyglot book, an easy way to consult a book when analyzing a game. new tab: tree of moves.